A nose that droops or points downward, especially when one smiles, can cause a prematurely aged or undesirable appearance. Rhinoplasty by Los Angeles Plastic Surgeon, Dr. Michael Bublik, can produce a nasal and facial appearance that is more attractive and balanced. Dr. Bublik has written articles on the nasal tip, its shape and its position, demonstrating his command of advanced rhinoplasty techniques in order to achieve natural and beautiful tip rhinoplasty results. Dr. Bublik’s approach to rhinoplasty is one that recognizes the importance of producing a NATURAL tip that balances well with the rest of the nose from every angle. It is well accepted by many that the key to a good rhinoplasty result lies in the tip. The nasal tip is comprised of a complicated arrangement of cartilage and ligaments, which in many patients, is inheritably weak and requires reinforcement. In patients who have thick skin or a drooping tip, the tip usually needs to be strengthened during surgery. A failure to provide this support can lead to undesired changes as the nose heals, even years following surgery. 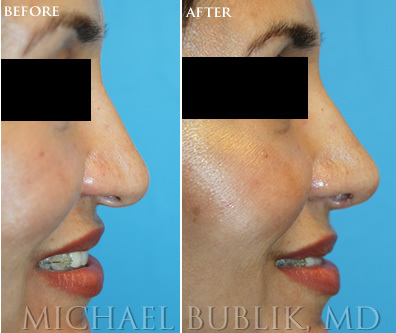 Dr. Bublik was trained by internationally renowned primary and revision rhinoplasty surgeons and has adopted their technique into his practice, which is evident in his post-operative results. This patient complained about having a "droopy tip" especially on smiling view. She is very happy with the result after only 2 weeks after surgery. Whether the tip needs drastic and difficulty rearrangement, such as in Dr. Bublik’s LOS ANGELES REVISION RHINOPLASTY patients, or small or subtle changes, with no changes anywhere else on the nose, surgery of the nasal tip is extremely complex and requires extreme detail oriented skill in order to achieve the desired result that the patient is seeking. My approach to the nasal tip is to build the tip complex and then to contour it which helps stabilize it and set the appropriate tip length. Sculpting the tip is artistic and requires an ‘aesthetic eye.’ This step involves small grafts and sutures to produce the appropriate width and shape to the tip that makes it appear natural. While this procedure may sound straightforward and simple, it often requires the longest time commitment and patience, which Dr. Bublik always provides. I often tell patients, who just require ‘tip rhinoplasties,’ that the healing process is usually shorter with less swelling of the nose post-operatively. This means that patients can return to work quickly without anybody knowing what was done. As with every area in rhinoplasty and plastic surgery, I approach each tip and patient individually. NO NOSE IS THE SAME. My customized approach to rhinoplasty is one of the main reasons people seek my expertise. Producing a tip that ‘fits’ the patient’s face and one that they desire is my goal. I believe that this is best communicated with a non-rushed and very comprehensive consultation. Often, Dr. Bublik spends hours with patients, looking through pictures, using “morphing” software, and discussing the surgery in order to really understand his patient’s desires.